Chocolate Stout Layer Cake – This Girl Loves to Eat! 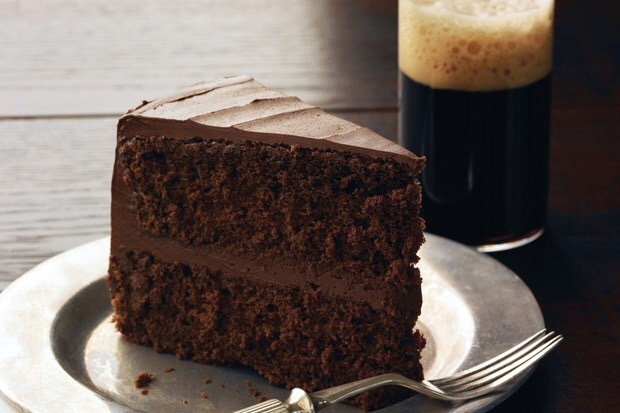 There is just something amazing about chocolate cake that’s made with beer! This recipe from the archives of Bon Appétit (October 2009) looks like something I can throw together for a day of Super Bowl munching without investing too much time hunting down out of the ordinary ingredients. Bon Appétit says, instead of cold milk, to serve this cake with glasses of the same beer you used in the cake batter. They even suggest making the stout into a float by dropping a couple of scoops of vanilla ice cream to the beer for a grown-up float. Yum! Bake cakes until tester inserted into centers comes out clean, about 30 minutes. Transfer cakes to racks and cool in pans 20 minutes. Invert cakes onto racks; remove parchment paper and cool completely. DO AHEAD: Can be made 1 day ahead. Cover and store at room temperature. DO AHEAD: Can be made up to 1 day ahead. Cover with cake dome and refrigerate. Let cake stand at room temperature at least 1 hour and up to 3 hours before serving. If you can find it (try Total Wine they have a great selection), use a chocolate stout (Brooklyn Brewery and Oregon’s Rogue Brewery for example) in the cake batter. The chocolaty flavors in the beer come from dark-roasting the malts. Some brewers even add a little chocolate to the beer as well. If you can’t find chocolate stout, use another stout, such as Guinness. Sierra Nevada Porter and Samuel Adams Honey Porter would also work well in this recipe. Posted on February 6, 2017 February 4, 2017 by ls1228Posted in Baking, Celebrations, Dessert, Party Food, Recipes, Tips & Tricks, TreatsTagged beer, bon appetit', Brooklyn Brewery, cake, chocolate stout, chocolate stout layer cake, Guinness, Oregon Rogue Brewery, Samuel Adams Honey Porter, Sierra Nevada Porter, Super Bowl.